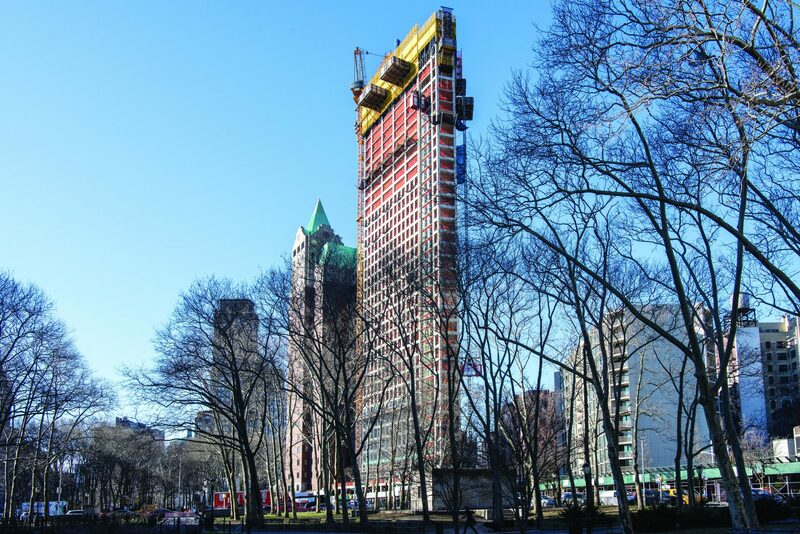 The Hudson Companies has topped out One Clinton, a 38-story luxury condo in Brooklyn Heights. The project launched sales of it 133 residences earlier this year. The Corcoran Group’s Cornell Marshall Team is exclusively handling the marketing and sales for the Marvel Architects-designed. The residential interiors are designed by Studio DB. Prices start at $1,227,000 for one bedrooms. Pricing for five-bedrooms has yet to be announced. Designed by INC Architecture & Design, with landscapes by Michael Van Valkenburgh Associates (MVVA), the 391 ft. tower had 24,000 s/f of amenities. 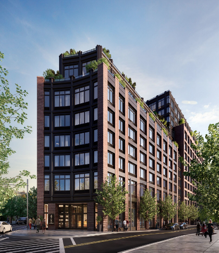 Located at 543 West 122nd Street near Seminary Row, The Vandewater will deliver studio to four-bedroom apartments priced from $970,000 to $6 million. Halstead Property Development Marketing is leading sales and marketing. 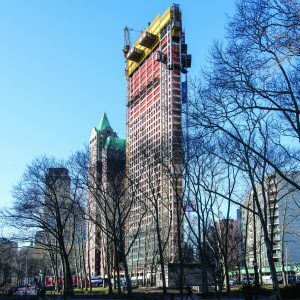 Closings have officially begun at 277 Fifth Avenue, the tallest residential tower on the Avenue. The building, which also just received its TCO and became an immediate occupancy building, has just under $150 million in sales. Move-ins will begin immediately. 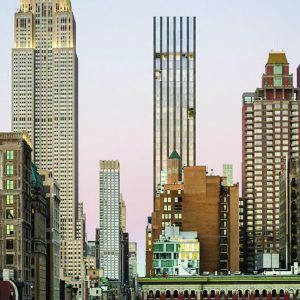 Created by architect Viñoly with interiors and amenities by architect Jeffrey Beers, sales are being handled by Corcoran Sunshine. The developers are Victor Group and Lend Lease with Shokai, the largest residential real estate developer in Beijing, a preferred equity investor. 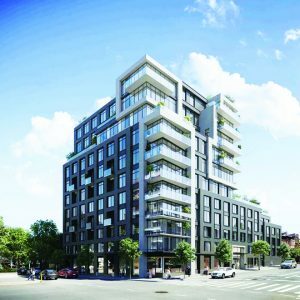 RXR Realty announced the launch of leasing at 475 Clermont, located at the intersection of Fort Greene and Clinton Hill. The 12-story rental features a collection of 363 luxury apartment and a suite of lifestyle amenities. Designed by Aufgang Architects, with interiors by Durukan Design, residences range from studios to two-bedrooms, some with private outdoor space. Rents start at approximately $2,330 for studios, $2,805 for one-bedrooms, and $5,210 for two-bedrooms. Occupancy is slated for this month. Douglas Elliman Development Marketing is the exclusive marketing and leasing agent on the project. 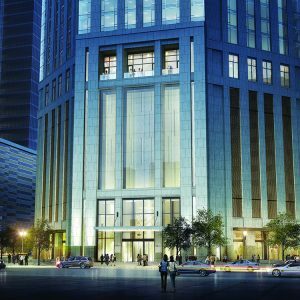 99 Hudson, a new luxury condo rising 79 stories above the Jersey City waterfront, has recorded 34 sales in the first quarter of the year. According to developer China Overseas America (COA), the sales velocity has been buoyed in part by an influx of New York City buyers who have been crossing the Hudson River. Designed by Perkins Eastman, 99 Hudson offers a collection of studio-to-three-bedroom homes including a limited number of top floor Penthouses, many with balconies and terraces. Condominiums range up to 2,500 s/f and are currently priced from $557,000 to $4,213,000. Initial occupancy is expected for late 2019. The Marketing Directors is the exclusive marketing and sales agent. 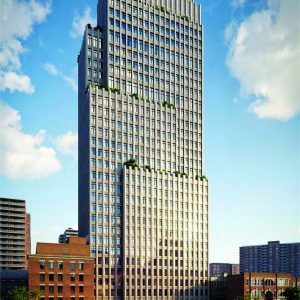 The Daten Group has launched 575 Fourth Avenue, a Fischer + Makooi 12-story luxury condominium in South Slope, Brooklyn. There are 70 apartments with 50 individual layouts, many with private outdoor space and views of Manhattan, the Statue of Liberty and the Brooklyn Bridge. Adam Meshberg’s Meshberg Group designed the building’s interiors and amenity spaces. The building will feature one to four bedrooms at prices starting at $675,000 to over $2.5 million. Douglas Elliman’s Gregory Williamson is handling sales and marketing.